Free Audiobooks -7500+ Free Audio Books is a free iPhone, iPad audiobook app which has about 7500+ free audiobooks for you to listen. 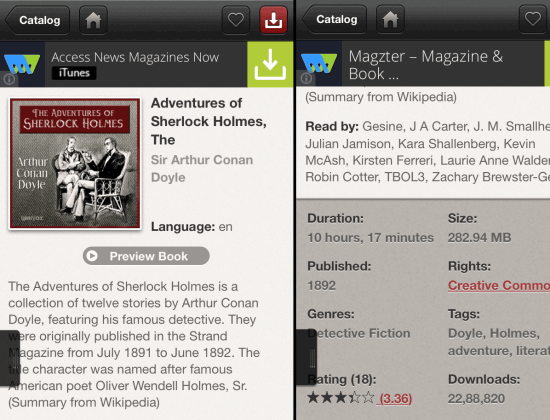 The best part is that all the books are absolutely free to listen, with no in-app purchases and no annoying ad pop-ups. You can listen to these free audiobooks even when you are offline. You can choose books from a wide range of categories. Some of the categories are: Inkstone Recommends, Books by Language, Genre, Most Downloaded, Top Rated, Duration, etc.. Some of the genres are: Action & Adventure, Ancient, Animals, Antiquity, Astronomy, Bibles, Biography, Comedy, Contemporary, and many more. This free audiobooks app also provides you with a preview of each audiobook, before you can start downloading it for reading the complete book. You can also mark the books you like as Favorite. Apart from this, when you have downloaded the books, you can sort them on the basis of author, title, and recent. When you launch the app, you will see the home screen of the app, as shown in below posted screenshot. You can see that it has some audiobooks downloaded by me. At the end of the list, there are three options: Author, Title, and Recent. You can tap on these options to sort the books on the basis of author, title, and recently downloaded books. 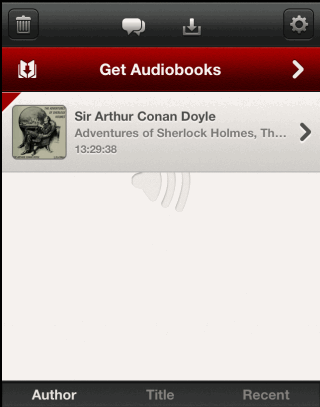 At the top, you can see that there is a Red colored option, labeled as Get Audiobooks. Tap on it to get the option LibriVox Live. When you tap on this, you will get a list of different categories of audiobooks from which you can choose the audiobooks of your interest. The different available categories are: Books by language, Books by Genre, Popular (Most Downloaded), Top Rated, Recent, Duration, Tags, and many more. After selecting the category of your choice, you will see a list of all the audiobooks which are available. Since all the audiobooks are free to download, you can tap on any and download audiobook free. 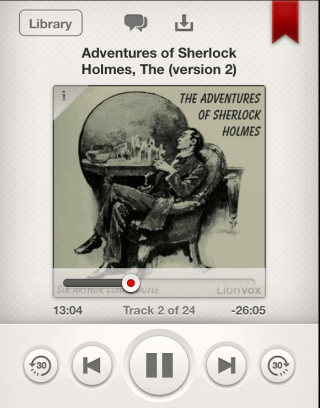 When you tap on the audiobook title, you will see details about the audiobook on next screen. From here, you can check the audiobook name, cover of audiobook, author’s name, language, summary of the audiobook, duration, and download size . The app also lets you hear to the preview of the audiobook so that you can decide whether you should download it or not. The options for marking it as Favorite and downloading are present at top. Each of the free audiobook is divided into different chapters and best thing is that you don’t have to wait for all chapters to get downloaded. You can start listening to the audiobook as soon as first chapter is downloaded successfully. Only thing that I didn’t like is that you can’t pause or stop the download of any audiobook once you start it. When you have downloaded the audiobooks, just tap on the name of the audiobook which you want to listen to. You will get an interface similar to that of a normal media player. 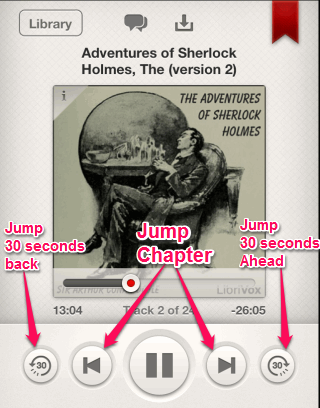 You can see that audiobook cover is displayed at center, with a time seek bar displaying the current time interval and remaining time interval. You can slide this time seek bar to fast forward or rewind the book. It is also displaying the current chapter (Track) number on the screen, along with total number of chapters in the audiobook. The rest of controls for controlling the playback are present at bottom of the screen. I have marked function of each control in the screenshot posted below. You may also like: 5 free Audio Books app for iPhone and Android. Free Audiobooks – 7500+ Free Audio Books is a really good iPhone, iPad audiobook app for listening to different audiobooks, and that too free of cost. 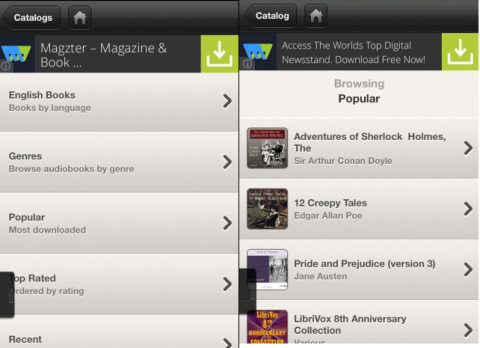 The app has a good and large collection of audiobooks, which means you can get books for almost all genre. The feature of offline listening also adds up to the goodness of the app. Do give it a try. Get Free Audiobooks – 7500+ Free Audio Books here.